The Rafael Derby is an all aspect, radar guided fourth generation air to air missile. In addition to airborne use, it can be fired from the Spyder SAM system. The South African Air Force Kenron R-Darter was developed in parallel and is externally identical. It is compatible with the LAU-7 family of launch rails, and can be used with Sea Harrier, F-16 Falcon, F-5E Tiger II and Kfir aircraft. 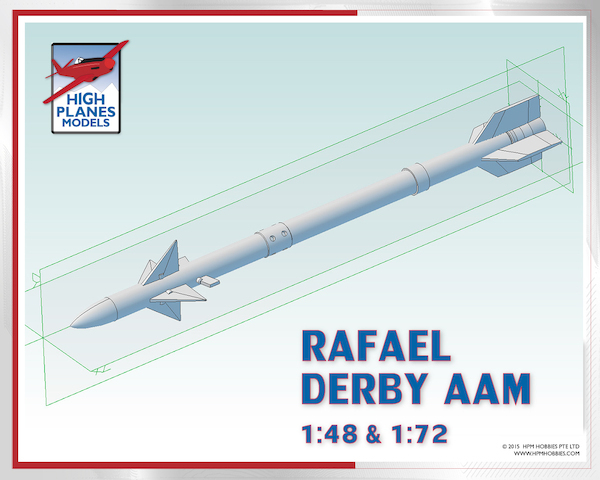 This High Planes accessory set includes two 3D printed missiles. Before using, the parts should be washed with laundry detergent and primed with spray primer. Priming and light sanding may be needed to remove print strata marks.